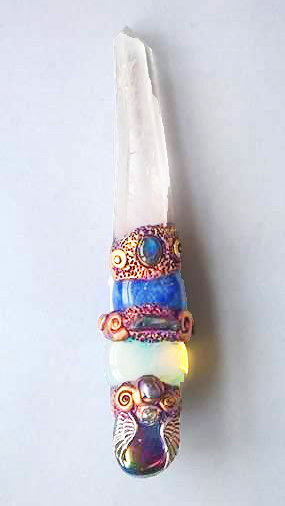 All wands have different combinations of healing crystals which gives them their unique and powerful energies. The power in these healing tools is amazing and you can feel them radiating their beautiful light out into the world and waiting to start their work. They can be used for healing, clearing, balancing, protection or ritual. 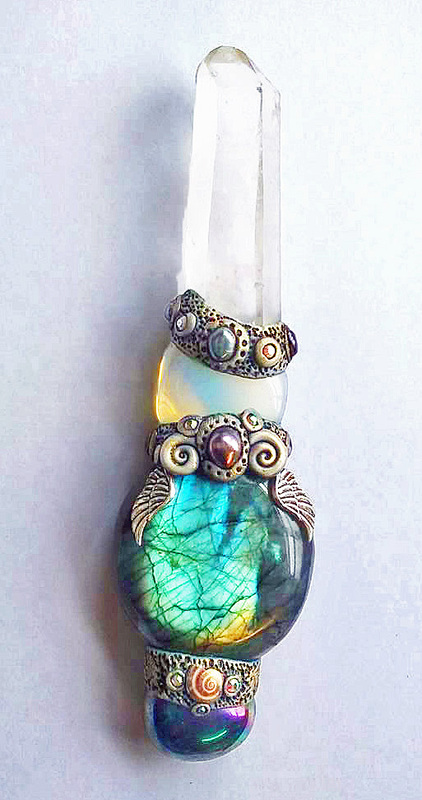 Energies; This amazing piece speaks of Magic, Mysteries and Empowerment. Healing the past and bringing light to the soul. A powerful healer on all levels but especially helpful for those needing to move on in life from the darkness into the light bringing the promise of better times ahead. And manifesting the magic within. 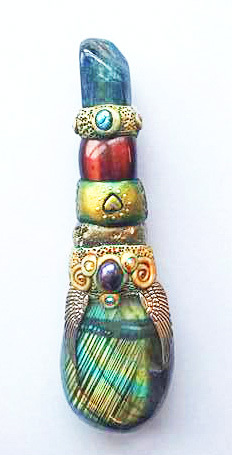 Energies; A healer from the stars but also connected to mother earth this gorgeous piece speaks of balance and harmony within. The star energy that radiates from this one has come to earth to heal and the owner of this piece will feel the healing energy true and strong. This one has lots of work to do on the earth and will find its home with a healer of the highest regard. Energies - Powerful hearler for the throat chakra, washing away karmic residue brought in from past lives and healing the aura and throat of dis-ease. Bringing a sense of wholeness back into being. Connecting to the ancient egyptian alchemy for healing, insight and power. Featuring Iron Pyrite and Dalmation Jasper this lovely talisman will help you get grounded and manifest all that you desire on earth. For use as a meditation tool and also helpful for psychic protection.